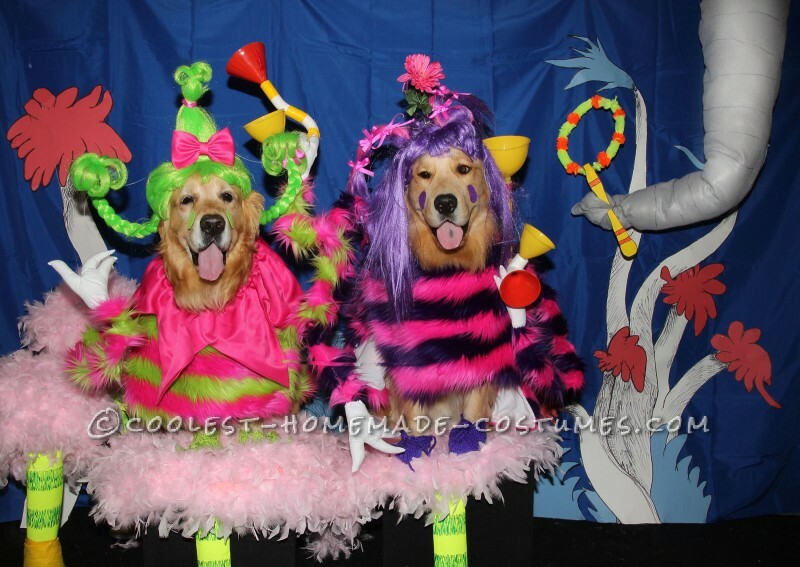 We decided to dress our golden retrievers Phoenix and Gryphon as Who’s from “Horton Hears a Who” this Halloween because we wanted to choose something cute, colorful, and whimsical we could have fun with. We’ve also always loved Dr. Seuss, and the messages he weaves into his stories. The Whos have been interpreted in some different ways, from Dr. Seuss’ original drawings, the animated specials, and the more recent movies. We wanted to do our own take on it, getting inspiration from all of those interpretations. We decided to make a nice Seuss looking background to go with it. Named Phoenix and Gryphon, each in a furry striped suit. And they wore pointy shoes, to cover their toes. Though if you missed seeing them, you were missing a lot. Though his friends thought him crazy, he knew they were there. But the Whos were just too small to spot, alas. He asked them to make noise, so his friends would know it was true. And through trumpets and who-horns, they blew and they blew. We decided the Who outfits should be made out of striped fun fur, since a lot of the Whos we looked at were striped, and they seemed to have a furry look. We wanted to use bright colorful material. We chose lime green and hot pink for Phoenix’s color scheme, and purple and hot pink for Gryphon. The outfits were sewn, with a shorter part over their chest area, and a longer part which went over their backs with a strap and velcro closure around their bellies. We also noticed that the Whos seem to have extremely long arms, much longer than average human arms. 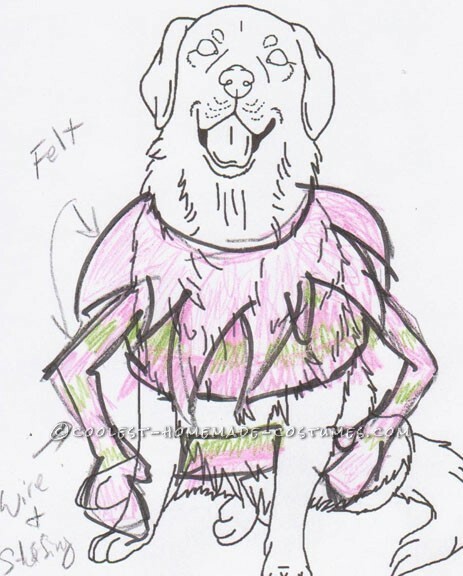 So we wanted to reflect that, and these costumes have thick wire arms with the fur wrapped and sewn around it. The hands are sewn out of white cotton material with three fingers, which look kind of like what Seuss had in his drawings. There are also collars in a pointy jester-like design sewn out of hot pink satin, with elastic at the top, to fit around their necks. For their hair, we noticed in the movie that the Whos had a lot of very interesting and unusual hair styles, in many bright crazy colors. We decided to get two different wigs, to differentiate the costumes a little. For one of them, we purchased a green wig intended for Cindy Lou Who. Although neither of these Whos is Cindy Lou, we thought the style of wig would still be appropriate for a different Who, and Cindy Lou Who doesn’t have green hair anyway. 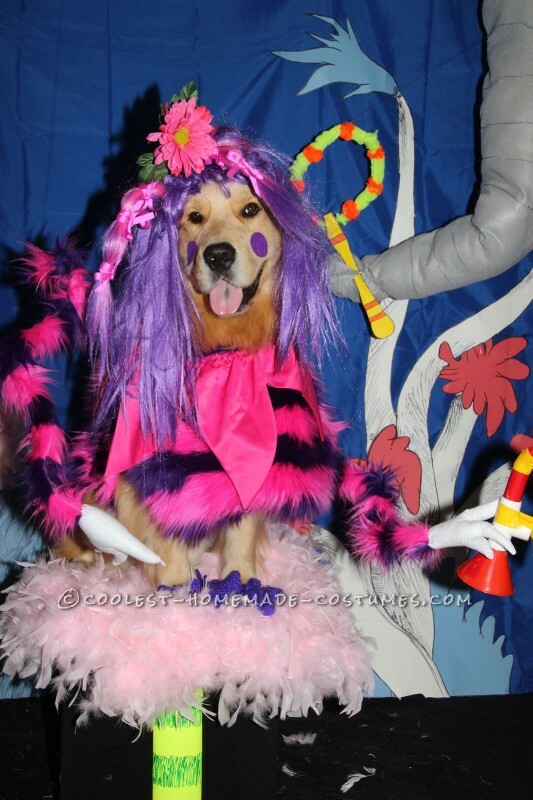 The other wig is purple and pink, which matched the outfit, and had two crazy pigtails sticking out. We decorated both wigs to make them even more wild. For the Cindy Lou style wig, we attached a big pink bow and some little pink bows on the ends of the braids. For the other wig, we wrapped wire around the pigtails to make them stick up more and we tied bows going up and down them. We also got a pink synthetic flower, and used wire to attach it to the top of the wig. The Whos in Whoville are known for having a lot of wild and wacky instruments. In “Horton Hears A Who”, the Whos have to make a lot of noise so that Horton’s friends can hear them and believe that they really exist. We wanted to include these Who-trumpets with the costumes. We noticed these instruments have different shapes than typical instruments. They have many bell pieces, which is the part of a trumpet where the sounds comes out, instead of just one like a usual trumpet. To make these, we purchased some pieces of PVC pipe. We had never worked with this before, but it turned out to be pretty easy. We bought pieces that were called R Traps, that were around a foot long and had an interesting curvy shape, to be the main part of the instruments. We then used different pipe fittings which screwed easily onto the ends, and that way the ends had more than one opening. On some of them we attached fittings with two openings and some with three. 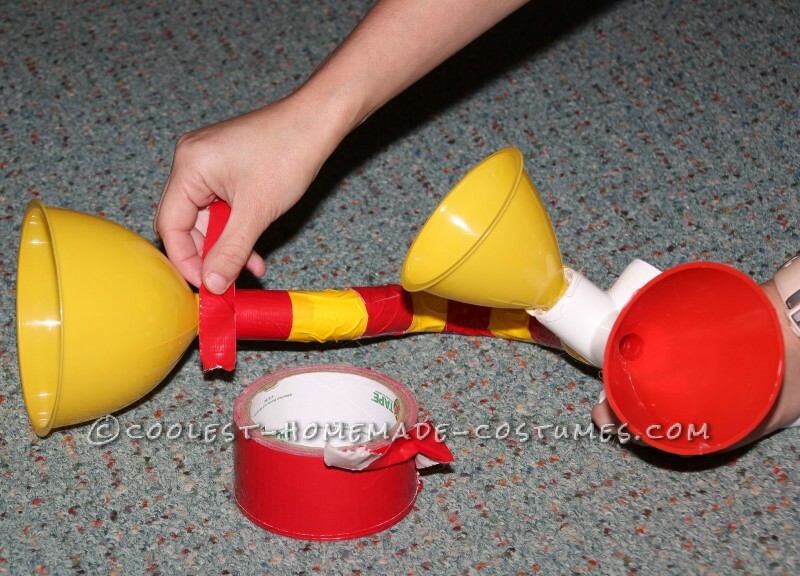 We also got funnels in red and yellow, in different sizes. We used hot glue to attach the funnels onto the end of the fittings, leaving one open on each to be the area you would blow into. We then covered the white PVC pipe with strips of colored duct tape to give them a stripey Seuss like look. In “Horton Hears a Who”, the Whos are a speck of dust to Horton’s eyes, and he catches the dust on a clover. We decided to include some of these clovers in the background of our photo. For the stems of the clovers, we used fluorescent yellow posterboard. We cut it into a thick strip and added stripes, using a green permanent markers to make scratchy lines like Dr. Seuss uses. Then we rolled each strip to form a tube and glued it closed. 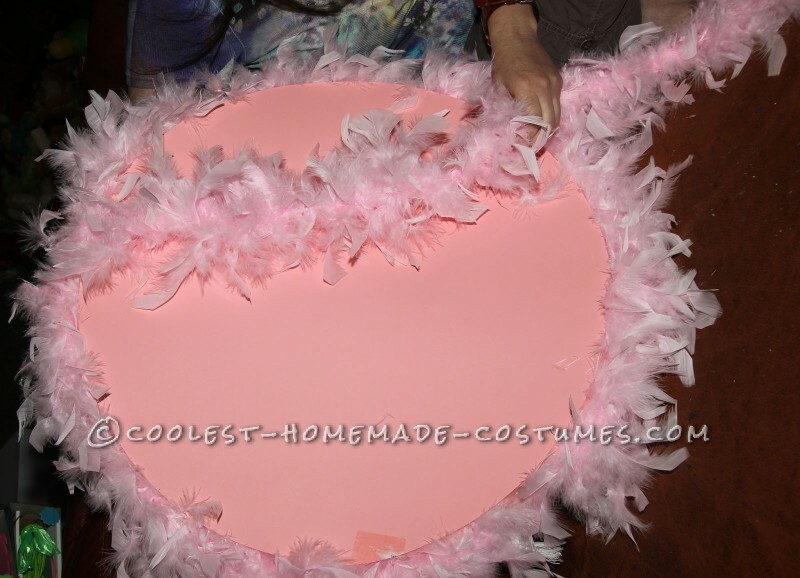 For the pink flowers, we used pink feather boas. We needed at least two 6 foot boas for each of them. We wanted some of the clovers to stand in the background, and some for the dogs to sit on. For the ones that stood alone, we covered a beach ball with the boas, gluing them on with hot glue until it was completely covered. We then glued the ball onto the top of the tube. We also made a base for them using a plastic container, which we cut a hole in and covered with yellow felt. For the dog clovers, we made a large circle out of pink posterboard, making sure it was large enough for a dog to sit on. We then glued a thin strip of posterboard, around 4” wide, along the edge of the circle. We then covered that circle with the boas in the same way. We were then able to use that circle to cover a small wooden box for the dogs to sit on, so they looked like they were sitting on a clover. Since the Whos are so tiny, Horton would be gigantic next to them. We saw that Dr. Seuss sometimes depicted just the bottom of his trunk near them, so we decided to do that. To make the trunk, we cut a large thick piece of gray felt on an angle, so that it was wider at the top and got progressively narrower towards the tip. We then glued heavy gauge wire in strips going down the felt in a few spots. Then we used the glue gun to form it into a tube trunk like shape and glue it closed. Then we stuffed it to give it shape, with a lot of stuffing. We also drew on lines with a dark gray marker, to indicate the wrinkles on an elephant’s trunk. Since the trunk had wire inside, we were then able to bend it in different ways, until we felt it looked most like an elephant’s trunk. 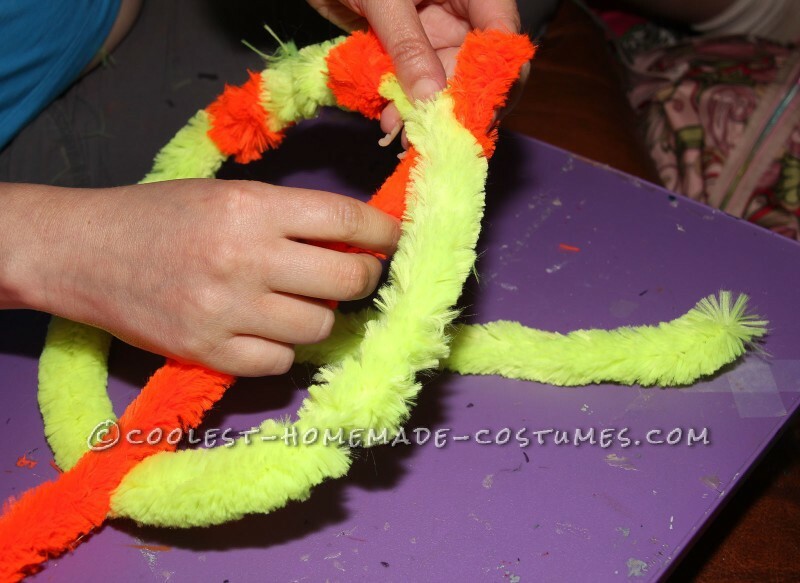 For the magnifying glass, we made the top part out of jumbo chenille stems. We twisted together a bright orange one and a bright yellow one, and formed them into a circle. We then drew a handle on posterboard and painted it, adding a Popsicle stick in back to help it hold its shape. We then glued the magnifying glass together and attached it to the trunk. 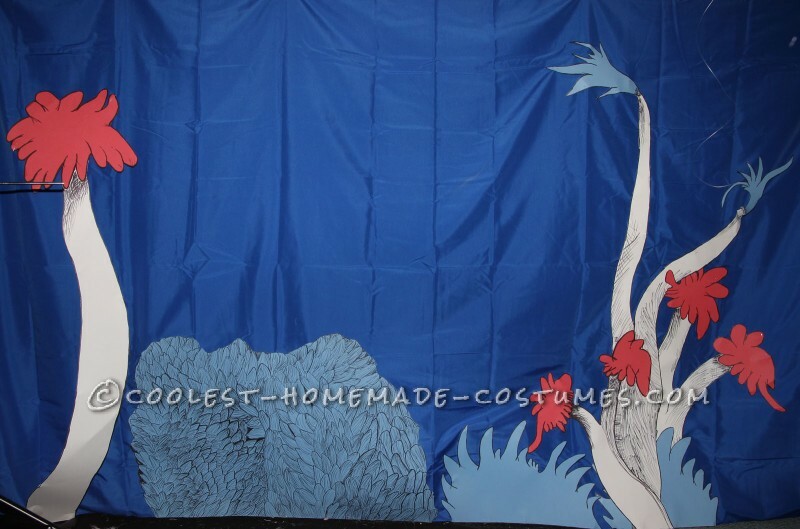 We decided to make a background in the Dr. Seuss style for the Whos to be in front of. We studied the drawings of Dr. Seuss and tried to draw some of the trees and bushes he had in the backgrounds of his books. We used white, red, and blue posterboard to draw the trees and bushes on. We then outlined the drawings with a black sharpie, and added crosshatch style lines and other sketchy black lines, trying to copy the style in the books. We then cut them out and pinned them to a blue sheet for the background. To complete the Who’s look, we got them slippers made of knitted yarn, with a hole in the bottoms so they could slip up over their ankles, and not have anything on the bottom of their paws to block them from walking. That way the bottoms of the shoes just rested on the tops of the dogs paws when they were sitting, and we pushed them up and out of the way when they were walking. 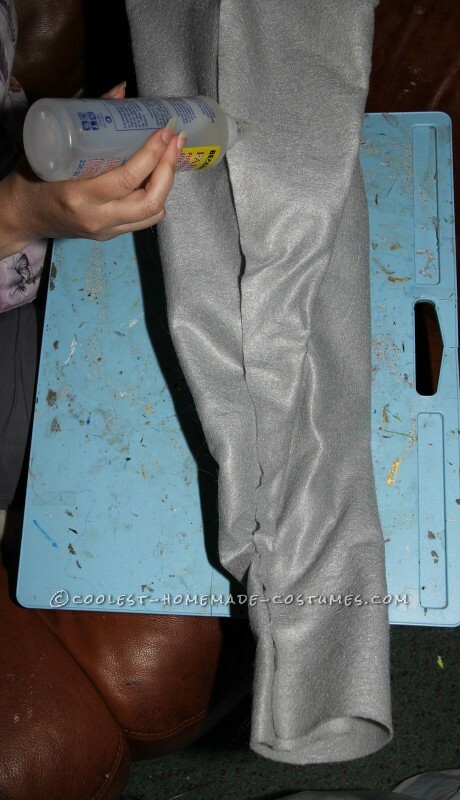 We glued thick elastic around the top edge of the slippers, so they would grip their ankles better and stay in place. 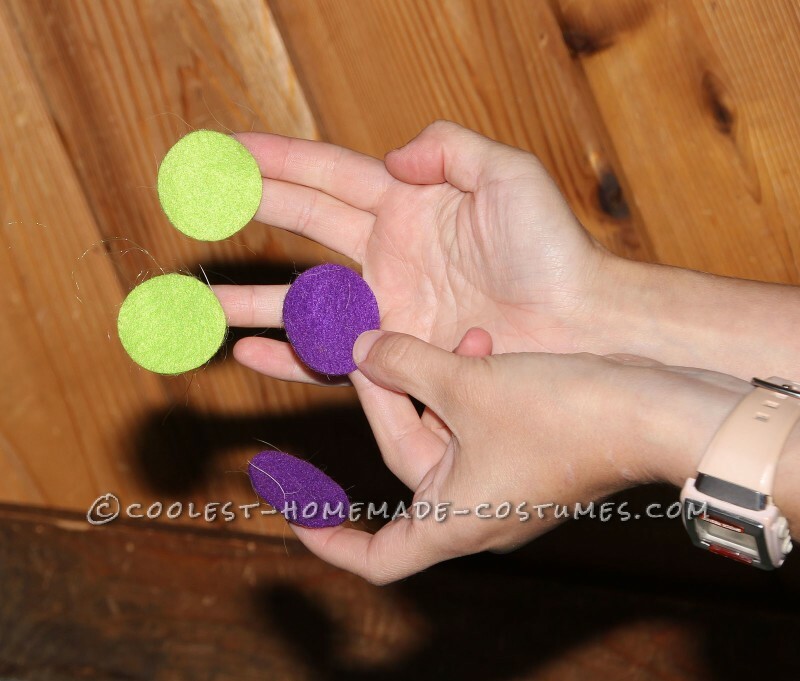 We also got sticky felt and cut it into circles, so we could add cute colorful cheeks that matched their outfits. The cheeks stuck lightly onto their fur, and were easily removable. We had some extras ready, since they sometimes fell off. These costumes were a lot of fun to make up, since we got to be a little imaginative and create our own vision of what a Who should look like. Everyone we showed the costumes to really loved them! 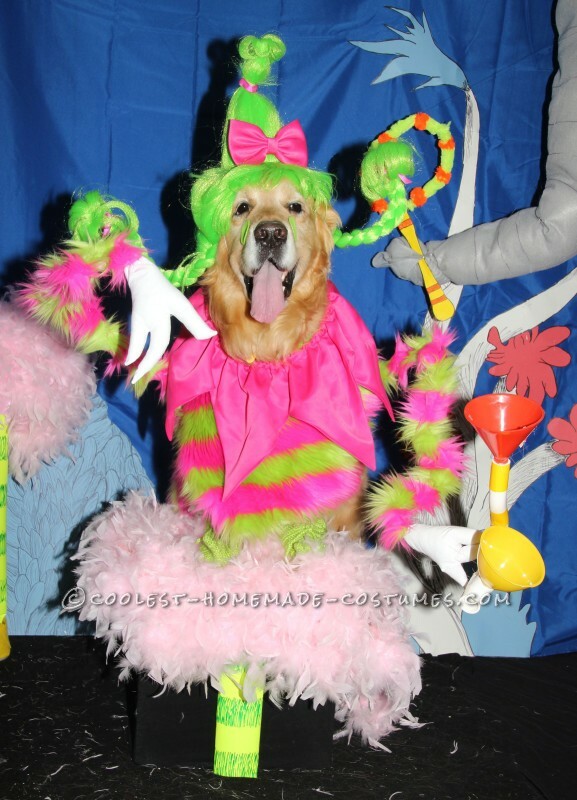 They loved the bright colors, and the funny wigs made them laugh. We think they were a hit!